ALERT: A little more science, but this time we take it to the next step – using science as background for creating a grazing plan that is sustainable for the pasture plants and our livestock. Previously in our on-going series on the science of plant growth and grazing we talked about timing grazing and haying based on the secrets of photosynthesis, and how the height of the sun changes how tall our pasture canopy should be in order to capture the most sunlight possible. Now we’re going to take those two parts and turn it into something you can use to help you plan your rotational grazing system. Here’s what we know so far: The green leaves of the forb or grass are the solar collectors gathering energy for the plant. When leaves are completely removed from a plant, new growth is dependent entirely on stored energy reserves. When some leaf area is left, plant regrowth is often faster since it is powered by photosynthesis and reserve carbohydrates. What this means to us as graziers is that the shorter we graze our pastures, the longer it will take them to recover. 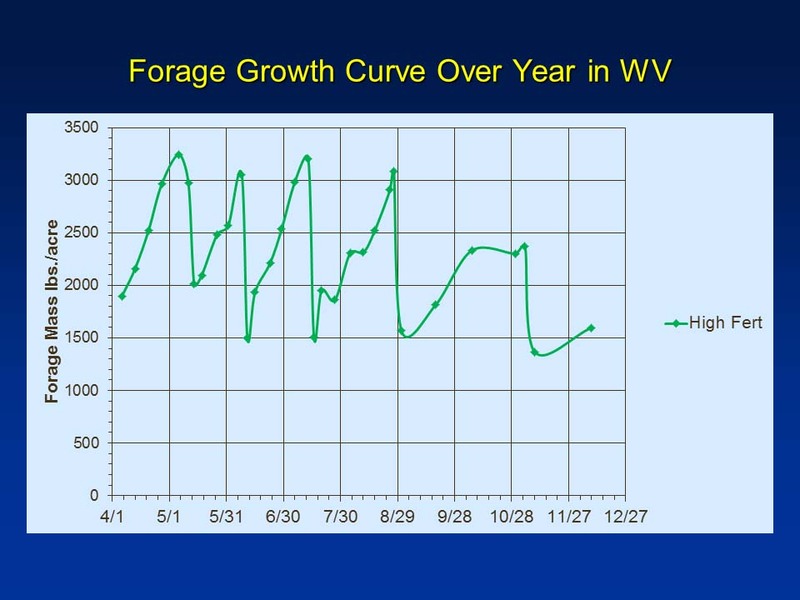 Example of growth, grazing and regrowth on a West Virginia clover-grass mixed pasture. Here’s an example from a year in a pasture in West Virginia on a mixed grass-clover pasture. The pasture was allowed to grow to 3000 lbs/acre of dry matter (DM) forage mass. Then it was grazed to 1500 pounds. From the graph you can see that it took about 30 days for the grass to rebound from 1500 pounds to 3000 pounds DM. Of course sunshine isn’t the only thing a plant needs to grow. You can see that when dry weather hit in mid-September, regrowth slowed and plateaued at 2000 lbs/acre DM. So how do we optimize pasture yield? Optimal pasture yield is achieved by grazing plants when they reach a height corresponding to a high point in energy reserves then grazing the pasture to a height which removes much of the forage but leaves adequate residual leaf area for photosynthesis and stubble with energy reserves. The optimum pre- and post-harvest forage height depends on the forage species or mixture you have. By grazing to two inches, clover gets a better chance to regrow. 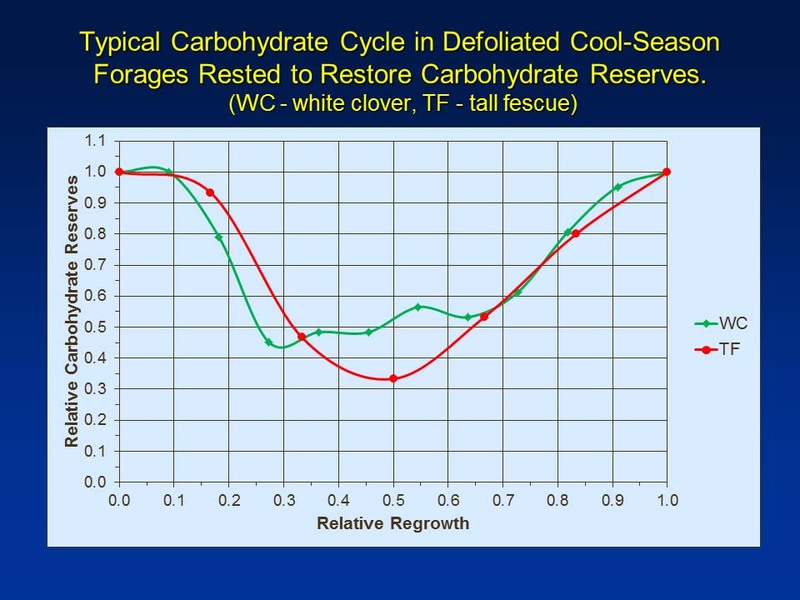 We can reduce pasture growth rate by grazing the pasture when it has low carbohydrate reserves. For example, graze a paddock down to a low residual forage mass (2-inch stubble). Then allow the pasture to grow back to about half the normally recommended height; a 5-inch height when we would normally allow it to come back to 10-inches. At this point the energy reserves will be at about their lowest point. Graze the pasture again to a 2-inch stubble. This removes the leaf area when there is little reserve energy in the plants. This results in a growth rate about half that which would occur in the stand if it had high energy reserves. If clover was no-till seeded prior to the second grazing it would have less competition and a better chance to establish. 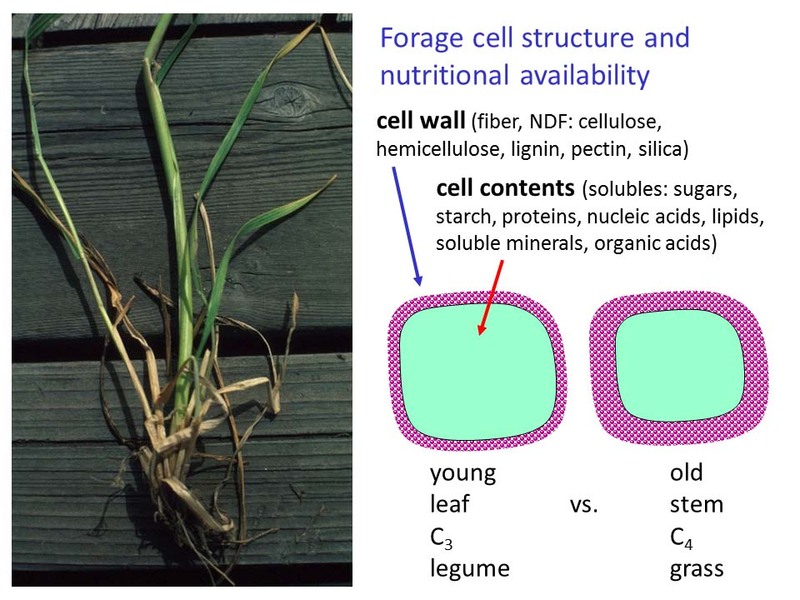 Hint for next week – it does have to do with age of the cells in the plant! Till now we’ve focused on what the plants need from us to maintain growth and store energy. Next week we’re going to cover how we’ll cover cell growth in plants and how that growth affects what our livestock get from the plants. Are you grazing in arid areas? The drier your environment, the less your plants grow, meaning you have different grazing challenges. So we’ll be sharing some information more pertinent to our rangeland readers in upcoming issues.